For most people, a single 5K or 10K is tough. A half marathon is daunting. A full marathon? Forget about it! But Southington YMCA Aquatics Coordinator Suzanne Clemente ran all four of those races in just four days. The Walt Disney Dopey Race consists of a 5K, 10K, half marathon and full marathon through the Disney World parks. The event starts with a 5K on Thursday, and ends with the marathon on Sunday. Clemente acknowledged that the Disney aspect made it even more special. Most of the thousands of runners were dressed like Disney characters, including Clemente. She dressed up like Darla from Finding Nemo for the first race, Kevin from Up for the second race, Mike Wazowski from Monsters, Inc. for the third, and Smee from Peter Pan for the finale. “I had so much fun dressing up, and looking at everyone's costumes,” Clemente said. The racecourses were spread throughout a variety of Disney parks and attractions. The marathon included all four main parks; Magic Kingdom, Animal Kingdom, Hollywood Studios and Epcot. Over the latter half of the race, Animal Kingdom and Epcot were open, with many people walking around. However, it was not all fun and games. The training leading up to the race was brutal. Over the four months leading up to the race, Clemente took part in an online training specifically designed to prepare participants for the Dopey race. Clemente’s journey to becoming a high level runner was a strange one. In high school, she hated running. She only ran short distance because she disliked long distance running so much. But in 2012, she picked up running again because she thought it would be an easy way to get exercise. She ended up falling in love. She participated in a half marathon later that year, and ran her first full marathon in 2014. “I’m not really sure why I even started running again, but I’m glad I did,” Clemente said. Clemente has worked at the Y since she was a Camp Sloper Counselor 15 years ago. She swam for the YMCA, so she thought it would be a sensible summer job. But it became so much more than that. She loved every single aspect of working for the Y. Over the years, she has worked as a lifeguard, camp counselor and waterfront director. She now works as the YMCA Aquatics Coordinator, where she does lifeguard and CPR training, lifeguarding and “everything and anything needed” at the pool. Clemente hopes that her experience with the Dopey run will motivate members of the Y community to tackle their own goals. On mother’s day weekend the Gymnastics team of the Southington YMCA traveled to beautiful central Maine to compete in the 2018 YMCA Northeast Regional Gymnastics Championships. This competition has a total of 34 YMCA's from Connecticut, Massachusetts, New York, Maine, Rhode Island, and New Hampshire with over 1,300 gymnasts participating. This was the second year in a row that the full team has qualified for this competition which is a big accomplishment. The northeast region for Gymnastics in the YMCA program is extremely competitive, so much so that it is actually harder to qualify for the regional competition then it is to qualify for the YMCA Gymnastics National Championships. The athletes have worked so hard this season and it showed this past weekend. We are now once again the Xcel Bronze Northeast Regional Team Champions. This means that out of all 34 YMCA'S that competed our Xcel Bronze team is number one. Along with this honor of first place team we have a total of 16 regional state championship titles with athletes ranging from Xcel Bronze to level 7. This year the Southington YMCA has 30 top 5 placements on individual events. Athlete Kara Loubier also earned the fourth highest all around in the entire competitions with a 37.9. This competition marked the end of the regular season for the team. 0n June 27TH 13 members of the Southington YMCA gymnasts will be traveling to Toledo, Ohio to compete in the 2018 YMCA National Championships. We wish them good luck, and a big congratulations a phenomenal season. Please register by email Coach Jamie at jlagoy@sccymca.org. The world is 71% water. Your children are 100% curious. Keep them safe. In the time it takes to answer a phone call, a child can become submerged underwater and lose consciousness. That’s how fast a drowning can happen. Drowning can occur nearly anywhere with standing water: pools, ponds, culverts, bathtubs—even a bucket. Water is a source of fun and recreation, but it can also be a source of fear. You don’t want your children standing around while their friends play in the water. But you can’t be everywhere every second. Teaching children how to be safe around water is one of the most important life skills parents can help to provide. It not only saves lives, it builds confidence. As a parent or caregiver, the last thing you want to do is limit your children. Don’t keep them sidelined. Let them be curious. Give them every opportunity to expand their horizons. When children learn how to be safe in and around water, it opens up a vast new world full of opportunities for them to develop self-esteem, discover new ways to stay fit and build relationships that can last a lifetime. Water safety is a community-wide issue. Help engage the entire community—to keep all children safe around water—by becoming an advocate in your neighborhood. Encourage other families to enroll their children in water safety programs and swim lessons. When you sign up your children for Safety Around Water, you are giving them skills to help keep them safe for a lifetime. You can help keep children safe around water. Take these steps to ensure they enjoy water-related activities safely. John’s 26-day, $15,000 Challenge Kicks Off June 1! He’s at it again! Beginning, Friday, June 1, Southington YMCA’s Executive Director John Myers will run 4 miles a day for 26 consecutive days in memory of Chase Kowalski and to raise money so that the Southington Y can continue to offer the Race4Chase Kid’s Triathlon training program. The Race4Chase Kid’s Triathlon Program, which was created by the Kowalski Family in memory of their son Chase, who was tragically killed at Sandy Hook, is designed to bring to children the same opportunity their son Chase had. He LOVED triathlon and won his first race at the tender age of 6! The free, six-week program provides kids ages 6-12 with a safe, healthy, non-competitive environment to discover the sport! It brings together kids of all different backgrounds and educates them about how to adopt a healthy lifestyle, coaches them to develop a foundation of athletic skills and inspires them to aim high in sports and in life! This year, we will receive no funding to run this program – so we are relying 100% on donations. Please consider making a donation in support of John’s effort to raise $15,000 this year. Click HERE to make a donation. *Don’t forget to consider that your donation could be doubled! Click here to learn more. Bob and I have been Southington residents since 2013. We have been married for 17 years and have a 14 year old son Aidan and 13 year old daughter Morgan. Bob and I are both educators. He is the principal of Hatton Elementary School and I teach second grade in Burlington, CT.
We have been members of the Y for a few years. I enjoy taking a variety of classes such as HIIT, barre and chisel. My daughter recently participated in the youth strength training and my son enjoys going to open gym to play basketball. When we have more free time this summer we are hoping to work out as a family and begin playing racquetball. Biggest struggle was finding the "right" time to work out. Y360 class in the am works perfectly for my husband and I and the 1/2 hour class is the perfect amount of time to feel like we got a solid workout. I always felt guilty not fitting in a workout at least 4x/week and when I worked out at home I got easily distracted. My husband would workout at home whenever possible, but not on a consistent basis. However, we never worked out together. Now we enjoy exercising together and encouraging each other to push ourselves. Y360 has helped us to try new exercises to strengthen various muscle groups and with the guidance of skilled trainers push ourselves in a safe, effective way. 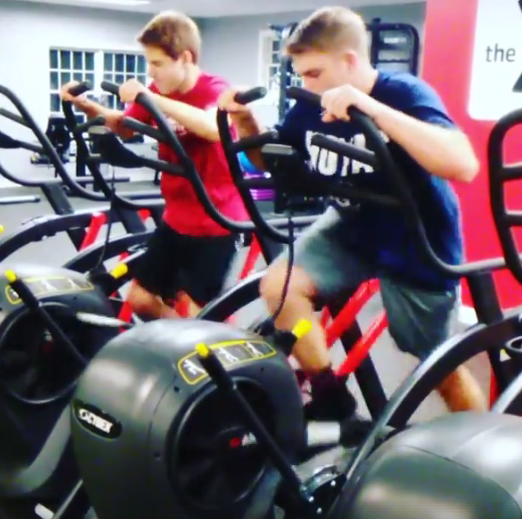 We also get our heart pumping with a variety of cardio moves we wouldn't normally do such as the sled, ropes, jump boxes, suicide drills, row machine and more. We aren't saying it's "fun" to get up for a 6:00am class, yet we always laugh while we are there and know that each time we go it will be a worthwhile, motivational exercise session. The instructors create sessions that allow us to challenge ourselves and/or make modifications based on our ability. Thankful that the Y offers this Y360 class every day of the week and at various times if we can't make our normal 6:00am class. The Y has so much to offer and we are thankful we are members. Provide overall coordination of all documentation relating to child records including health forms and medications. Please send electronic resumes and 3 letters of reference to Wendy Stevens at wstevens@sccymca.org. For questions on the position, please contact Katie Sherman, Director of Child Development at ksherman@sccymca.org. Resumes are being accepted until May 7th. Important: The YMCA is an equal opportunity employer. Applicants must complete and pass a criminal background check. Jump Start is a Pre k program for children eligible for Kindergarten designed to ensure they are ready for Kindergarten! The Southington YMCA is thrilled to offer a curriculum focused Pre K program to prepare your child for Kindergarten. Children must be eligible to attend kindergarten to enroll. The daily schedule runs much like a Kindergarten classroom with a focus on Connecticut Common Core Standards including Math, Literacy, and Science. Enrichment opportunities may include swimming and field trips. Please note that full-time enrollment guarantees that your child will be included in all activities, trips and special projects! Full-time enrollment also includes a free family membership to the Y! There are many benefits from an extra year of preschool. Time to hone social skills such as taking turns, sharing, listening, independent problem solving, playing cooperatively, asking for help when needed, sitting and listening attentively to a story and gaining self-confidence. Opportunities to develop both fine and gross motor skills. Find out how YMCA PreK programs set kids on the path to a better tomorrow. Schedule a tour. 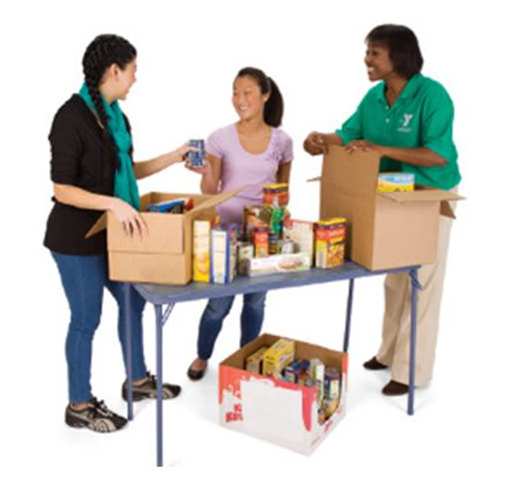 Saturday, May 12th 8:00 a.m. to 12 p.m.
On May 12, 2018, the Southington Post Office is holding its Postal Food Drive. The Post Office is looking for volunteers to drive postal routes from 10 a.m. to 12 p.m. Volunteers will help the mail carriers by picking up bags of food. The Southington Post Office will hand out routes to volunteers between 8 a.m. and 9 a.m. in the Post Office back parking lot. Volunteers will drive the route and pick up bags of food and deliver them to the YMCA Learning Center. This food drive benefits Southington Community Services, Tabernacle Food Bank, and Bread for Life. This is truly a collaborative effort, and this volunteer project will benefit numerous individuals in our community. Congratulations to John Myers, YMCA Executive Director on being honored last night by United Way of Southington during their annual meeting! Southington, CT- April 18, 2018 – In memory of Benjamin Buckley, who passed away at age 7 due to severe asthma-related health issues, YMCA Camp Sloper and Ben Was Here Inc., will host the 3rd Annual Ben's Fun Run, which will take place on May 19, 2018 at YMCA Camp Sloper. Mark Pooler, Director of Operations at the Southington Community YMCA, comments “The Buckley family has been an inspiration to many in town. The way they have worked to keep Ben’s spirit alive is wonderful. We are happy to support whatever efforts we can so they can continue their generosity and giving back in his name"
The 3rd Annual Ben's Fun Run will feature a one-mile race for 3rd, 4th, 5th and 6th graders around Sloper Pond located at, 1000 East Street in Southington. The event is open to Southington residents as well as any other towns this year. The goal is to commemorate the life of Ben Buckley while increasing the health and activity of youth in our town. Sign in will start at 8 AM and the first race will take place at 8:30 AM. Please see below for the race schedule. There is no cost to participate in the run; however, donations will be accepted for future trail improvements at YMCA Camp Sloper. Following the run, the Buckley Family will generously provide refreshments for all runners. Registration is currently open and ongoing. Interested runners are encouraged to register ASAP so they do not get closed out. Registration is limited to the first 250 runners. For more information and to register, please contact Bob Lasbury, Race director at rlasbury@southingtonschools.org or visit http://bit.do/bensfunrun . If you would like to volunteer to help with this amazing event, please contact: Kristen Curley at englishclassrunner@cox.net. The Y is one of the nation’s leading nonprofits strengthening communities through youth development, healthy living and social responsibility. Across Southington and Cheshire, CT the Y engages men, women and children – regardless of age, income or background – to nurture the potential of children and teens, improve the nation’s health and well-being, and provide opportunities to give back and support neighbors. Anchored in our communities, the Southington-Cheshire Community YMCAs was established in 1928 and has the long-standing relationships and physical presence not just to promise, but to deliver, lasting personal and social change. YMCA membership, YMCA Camp Sloper, the Learning Center, the gymnastics center and all Y programs and facilities are welcoming, inclusive and open to all regardless of income. For more information, stop by for a tour (29 High St. Southington, CT) or visit Sccymca.org. Roll out your yoga mat and join us as we fill the Southington Town Green with yoga, community, and fun! The YMCA, SoulSpace Yoga & Wellness, and Bloom Yoga Fitness Studios of Southington have teamed up to celebrate health, giving, and positive well-being, through this special community event. Come enjoy an energizing yoga class right outside on the Town Green, surrounded by fellow yogis and friends. The class will begin with a centering meditation, followed by a 60-minute yoga flow designed for all levels of practitioners. This special event is welcome to all (no yoga experience necessary), and there is no cost to attend! Please bring your own yoga mat or a towel to practice on, as well as a non-perishable food item to be donated to Southington Bread for Life. The competitive team at the Southington-Cheshire Community Gymnastics Center ranges from Level 2 and has gymnasts as high as Level 8. The program is designed to help Gymnasts progress at their own rate in a positive and supportive environment. The team has won multiple awards around New England in the USA Gymnastics and YMCA programs; as well as had athletes place at the 2017 YMCA National Championships in Savannah, Georgia and the 2017 YMCA Northeast Regional Championships in Maine. To register for a tryout please email jlagoy@sccymca.org for more information. Turning 90 means it’s time to celebrate. We have a full week of activities from May 7th through May 12th. During this week, the Y will be open to the public (open house style) offering a week of themed classes, events, and giveaways. It’s our gift back to the community. Plus, enjoy our favorite flavored water! Adults come celebrate our birthday in the pool. Wear your favorite party hat and party with us during this 45-minute aerobic dance party! Join us to reminisce about YMCA and Southington history and enjoy your favorite dish. Help us celebrate the actual day our YMCA was founded with a community picnic at the YMCA Learning Center. Pack a picnic and join us for fun and games including a bounce house, face painting, a ride on the Sloper Express and more! Every fitness class all day will have a birthday theme. POUND Class 5 PM in the lobby. Join us for a special Birthday Themed TwYlight including an Ice cream bar, Trivia in the APR with prizes for the top three teams and a dance for the last half of the night. In the gymnasium (three-point contest, point guard contest, speed testing, dunk contest). For those ‘history buffs’, we will have our scrapbooks out that date back to our beginning years. What a glorious trip down memory lane. Feel free to drop by at any time that week. Each month Julia and Gina lead a 90-minute cycling class unlike any other. Playing to a theme class may be covered in green for St. Patricks day, game ready for Superbowl, or ready to jingle bell rock with other holiday themes. Beyond the themes, these phenomenal classes feature out of the ordinary cycling exercise. At the conclusion of the March - St. Patrick's Day themed class I arrived to note that the participants were stepping off of the bikes and returning full-size pool noodles to a large box. During the activities, cyclists used the noodles as their jousting lance as they jousted their way to the imaginary castle. An essential component to keeping the energy positive, Gina and Julia teach the class in tandem, both riding in front of the class, taking turns instructing portions of the activities. The next 90 minute themed class is April 22. To reserve your bike contact the fitness center at 860-426-9528. A Cheshire native, Julia, and her girls are active members of the YMCA community. Previously working for the YMCA Learning Center, Julia has been a certified Spinning Instructor for 9 years and teaches cycling as well as the ever-popular POUND classes. Click here to see Julia leading a sample POUND class at Healthy Family FunFest. Julia's daughters, Jordan and Jia, are members of the YMCA Leaders Club and help their mom carry supplies from the St. Patrick's Day class. A Southington native, Gina has been a part of the Southington Community YMCA since high school. She was always athletic but it didn't begin to take her fitness seriously until a diagnosis of high blood pressure and the risk of being medicated for it for the rest of her life swayed her to become even more involved with The Y. In the present day, Gina is a Keiser Certified instructor teaching Barre, Zumba, and HIIT. She can also be found providing personal training and coaching the YMCA Running Crew. An avid runner Gina recently completed her 4th full marathon. Mark your calendars and bring the kiddos, early childhood open house is April 25 from 6 to 7 PM at the YMCA and YMCA Learning Center! Refer a new or returning member and you will each save 10% every month for up to one year while you are both members. Visit the front desk to learn more. Valid for adult, family, and senior memberships only. Offer expires April 30, 2018. Athletes and parents will sometimes ask, “What should I do outside of training at the SPC?”. One of the main goals at the SPC is to teach our athletes how to train smart even when they aren’t with us. This means having a balanced program that provides them with the right inputs in order to achieve the desired adaptation. If an athlete wants to get stronger and faster, does it makes sense to only do curls and bench press on an "upper body" day? Obviously no, yet that is what many male high school athletes do on their own. If a female athlete is looking to become more agile on the field, but only runs long distances and lifts 10lb dumbbells, the carryover will be minimal. When writing a program, a few major components are essential in order to ensure the greatest impact. This is where the 80/20 rule really comes into play. Say I have 5 exercises in a lift: heavy deadlift, bicep curl, plank, push up and a 1 arm kettlebell overhead press. If I could only do one, which one would give me the most bang for my buck? The answer is the heavy deadlift. If I have other qualities I want to develop like speed, rhythm, power, mobility and work capacity, why would I waste my time with the other 4 exercises? Following this concept, we start with 4-6 warm-up exercises that prep the athletes to use their hips, shoulders and stabilize their core. 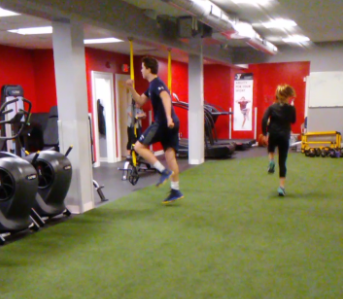 All of our warm-up movements carry specific purpose related to our training. Then we move to the dynamic warm-up which doubles as our agility and rhythm practice. These 3-4 drills elevate the athlete’s body temperature and work on coordination and agility. Next comes conditioning or power work. For efficiency, we only use 1-2 exercises with a specific time or number to reach. Our last category is strength. Depending on the athletes' needs, some will spend more time with 2-4 strength exercises while others may have more work capacity incorporated. If this is something you or your team need help with, email me and we can brainstorm some ideas! Southington, CT and Cheshire, CT – February 15, 2018 - Registration for YMCA Camp Sloper began on Saturday, February 3rd with tons of parents taking advantage of online registration at 8AM to get their child signed up for their favorite camp program this summer. “We had the most registrations in the first day ever” stated Justin Hubeny, who will lead YMCA Camp Sloper as the Camp Director for his 1st season this summer. “We took in more than 1400 registrations the first day and over 1500 by the end of the first weekend. We are very lucky and fortunate to have wonderful YMCA Camp Sloper Families that support us. For me as Camp Director, I couldn’t ask for more”, Hubeny stated. “I am pleased to announce that Eli Rosin wins the award for first camper to register for 2018” says Hubeny. Eli Rosin was the first official camper to register at 8:03 AM on Saturday morning. “I like doing all the different activities, but my favorite activity is archery” stated Eli who will be attending Sloper for his 3rd year this summer. Eli says one of his favorite moments at camp is” seeing the other kids when Camper of the Day is said.” Eli will be attending STEM Camp this summer at YMCA Camp Sloper. When asked what he thought about his counselors from last year Eli said “The counselors are all fun and funny, I like making nicknames for them.” Eli is looking forward to being in STEM Camp this summer with his friends, going to archery, and he is very much looking forward to trying out the New Ninja Warrior Course that will be built this spring. “Maybe I can be a tester for the Ninja Warrior Course,” Eli said. Dad, Pat Rosin and Mom, Bethany Rosin, were asked why they felt YMCA Camp Sloper was a good choice for Eli, “We send Eli to camp because we know he will be engaged in exciting activities outside, surrounded by great role models.” stated the Rosins. “We have received over 1,800 registrations to date, which is way ahead of last year’s registration. Last summer we had most of our specialty camps fill up and many of our traditional camps fully enrolled. The Sloperian program for Kindergarten and First grade is also very popular. It is a great introduction to a full day of activities, much like they will experience in full-day kindergarten” stated Hubeny. “We have room now, but we encourage parents to put down a deposit now and reserve their spot for the summer,” stated Justin Hubeny. YMCA Camp Sloper, which serves the towns of Southington, Cheshire, Berlin, Kensington, and New Britain, has grown in popularity in recent years. Open registration is on-going at either the Southington or Cheshire YMCAs during normal business hours or online at www.ymcacampsloper.org. There is still room in many of the specialty camps and all of the traditional camps; registering early is encouraged so you can select the program of your choice before it fills up. YMCA Camp Sloper has four, two-week sessions running July 2 - August 24. There is also a one week preview the week before the regular camp season begins, June 25 – 29. The day camp program runs Monday through Friday 9:00 AM - 3:00 PM with extended camp care available if needed. YMCA Camp Sloper serves children ages 3 to 15 years old. Bus transportation is provided for residents of Southington, Cheshire, and Berlin/Kensington for campers entering kindergarten through grade 10. The Wanderers program for preschoolers runs from 9:00 AM-1:00 PM with parents transporting their children. “We also provide financial assistance for families in need. It is just a matter of contacting the Southington or Cheshire YMCA and completing the application process” stated Hubeny. Extended payment plans can also be arranged. Secure your child’s spot for a summer full of FUN – ADVENTURE – TRADITION! Any questions can be directed to the YMCA Camp Sloper Outdoor Center at (860) 621-8194 or visit our website at www.ymcacampsloper.org. Are We Too Preoccupied With Rare Large Injuries? Over the past 10 years we have seen a climb in the rate of sports’ injuries, especially ones that require surgery. While these numbers seem high, they actually represent 1% of the youth athlete population that may tear their ACL. The question arises: Are the numbers to the point that our training programs need to strictly address the prevention of these specific injuries? Data from a brief case study over the past 2 months at the Sports Performance Center illustrates a different scenario. Out of 30 athletes, five had some type of soft tissue injury. These injuries either prevented them outright from doing their training program, or decreased their ability to perform at 100%. Roughly 15% of our athletes are walking in the door with some sort of painful dysfunction. Instead of focusing on the 1%, why not focus on the much higher number of athletes that will develop a chronic injury that prevents them from training hard and can become a precursor to a larger injury? Frequently, coaches and parents inquire about specific injury prevention strategies when it might be smarter to look at the bigger picture. When we look at injuries, Mike Boyle said it best, “you either have a traumatic event (concussion) or overuse issues”. These overuse issues are easily preventable or managed. One of my athletes has intermittent left medial knee pain. When she moves too much, the inside of her knee hurts. Initially we screened for potential causes of pain. Nothing hurt, but she did have limitations in left ankle mobility and motor control of her right hip. We removed a lot of the jumping and cutting that originally caused her knee pain to flare, and added in exercises that addressed her ankle and hip limitations. As a result, in just one month, she is experiencing no pain with training, and her pain after 2hr goalie sessions has decreased to “barely noticeable”. Here is the best part. SMART TRAINING = TRAUMATIC INJURY PREVENTION. The take home message here is that soft tissue/overuse injuries far exceed the number of traumatic injuries that most people are scared of. In addition, they are huge contributors to traumatic events. External force, a fatigued state where muscles can’t keep up with demand and poor mechanics that put a joint in a compromised position are the three main factors in acute injury. Smart training that addresses mechanics, strength and recovery, and workload management of practices, training and games, have far greater impact on overall injury prevention than simply a few targeted exercises.